Our Aluceptor range shown in the table opposite features retentions from 1800 litres up to 14,400 litres in single cell units. Larger systems are available up to 250,000 litres. The Nominal Size of the unit is given to the treated flow through the unit, which is calculated from the given catchment area that the separator is serving. 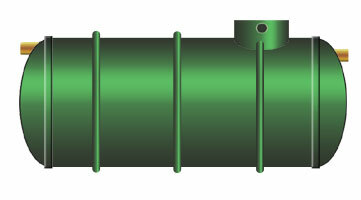 A (drainage area m2) x 0.018 = Nominal Size Unit. A (333m2) x 0.018 = NS 5.9. So for this application we would supply our NS6. However, as can be seen in the chart this would only give a Full Retention capacity of 3880 litres. Typically if this were a petrol forecourt fuelling area, then the volume in the separator would not meet the requirement for retention. It is recommended that the unit be sized to retain the spillage of the largest tanker cell that is being delivered to a particular hard standing area. It is important to install a forecourt separator of an appropriate size. On a forecourt where tanker deliveries are received, a separator with an oil storage capacity of 7,600 litres will meet the requirements of BS EN 858-2, clause 4.3.6. If a smaller unit is proposed, the size should be determined by undertaking a risk assessment incorporating catchment size, potential spillages during delivery, and other risks such as safety issues. If the compartment size of the tanker that delivers to your site is greater than 7,600 litres your separator should be sized accordingly.